↑ "The Relative Influence of European Writers on Late Eighteenth-Century American Political Thought," American Political Science Review 78,1(March, 1984), 189-197. 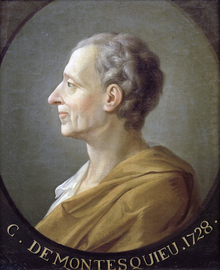 ↑ Montesquieu (1734), Considerations on the Causes of the Greatness of the Romans and their Decline, The Free Press, สืบค้นเมื่อ 2011-11-30 Ch. XVIII. ↑ G. Balandier, Political Anthropology, Random House, 1970, p 3. ↑ D. Pocock, Social Anthropology, Sheed and Ward, 1961, p 9. หน้านี้แก้ไขล่าสุดเมื่อวันที่ 13 เมษายน 2562 เวลา 04:53 น.